Team manager Mark Dutton says that an increase to the mandatory tyre pressures aimed at helping tyre life at Phillip Island contributed to the failures on the Triple Eight Holdens. Triple Eight had been the only leading team not to endure at least one of the 18 failures that hit during Saturday’s opening 250km leg of the WD-40 Phillip Island 500. The Holden squad was vocal in its opposition to the prospect of rule changes being implemented for Sunday, describing the issues others suffered as being ‘self-inflicted’. A Supercars Commission meeting on Sunday, however, saw the minimum tyre pressures upped from 17psi to 19psi alongside recommendations for front and rear camber settings. Only five cars subsequently suffered failures during the race but, shockingly, those affected included all three Triple Eight Commodores. Dutton said post-race that the team takes responsibility for the failures, but pointed to the increased tyre pressures as a factor that contributed to their downfall. “The higher pressure hurt us, not helped us because the cars felt so much worse,” Dutton told Supercars.com. “It wasn’t that it was a silly thing to increase the minimum pressure, but there’s a fair chance that if we didn’t have that minimum pressure rule our tyres wouldn’t have blown. “It upset our balance and in hindsight we should have been more on the front-foot to tell the drivers that it was going to slide more and they needed to go slower. “The thing is we don’t run long stints at those higher pressures because when you do that it makes the car handle worse. We don’t set the car up around those pressures. Dutton says the biggest unplanned element was the opening lap Safety Car that resulted in longer than anticipated stints, which combined poorly with their choice of set-up. “When the Safety Car came out and went against what we intended we should have known that we needed to react more and slow the drivers down,” he said. “We were the fastest cars on track and we didn’t have the fastest cars. That should have shown that we were pushing too hard and I kick myself for that one. “We’d tuned for faster, shorter stints and didn’t respond as well as we could have. While the two Red Bull entries had right-rear tyre failures in quick succession towards the end of their long second stints, the TeamVortex car did a right-front six laps from home. “That one was the much more surprising one to me,” admitted Dutton. “The fact that the two others went within a lap points to the camber being incorrect, but Craig’s looks like something different. We have a few theories on that but we’re not sure. 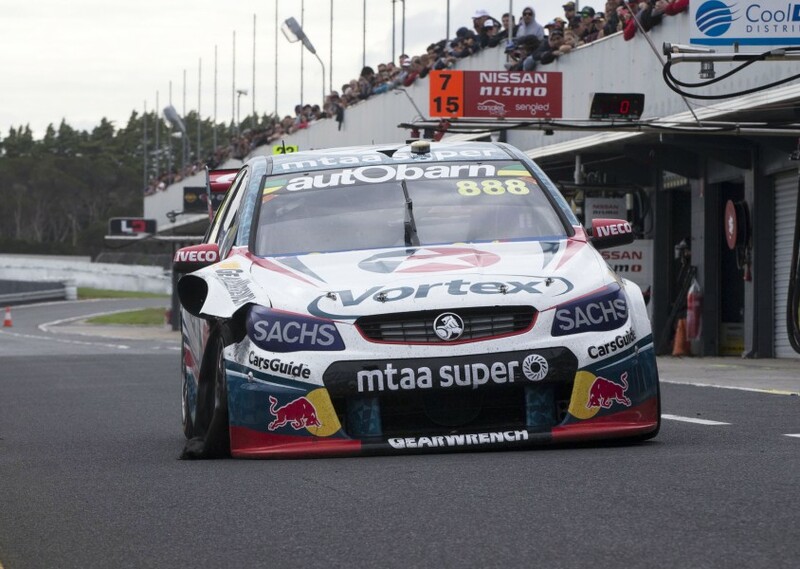 Van Gisbergen, Whincup and Lowndes ended the race 16th, 18th and 23rd respectively.